Vinegar is a remedy with multiple uses for dogs including: alleviating allergies and arthritis, and helping to provide the correct pH balance. You can also give apple cider vinegar to any animal by simply added it to the water. If your dog has itchy skin, the beginnings of a hot spot, incessantly washes its feet, has smelly ears, or is picky about his food, an application of apple cider vinegar can help. For poor appetite, use it in the food at 1 tablespoon, two times a day for a 50 lb. dog. 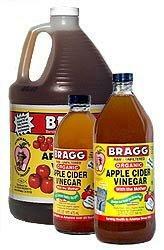 For itchy skin or the beginning hot spots, put apple cider vinegar into a spray bottle, part the hair and spray on. Any skin eruption will dry up in as soon as 24 hours and shaving the dog won’t be necessary – which is good because I never recommend that. If the skin is already broken, dilute apple cider vinegar with an equal amount of water and spray on. Add 1 tablespoon apple cider vinegar per gallon water to the pets drinking water. Brush and exercise them regularly.